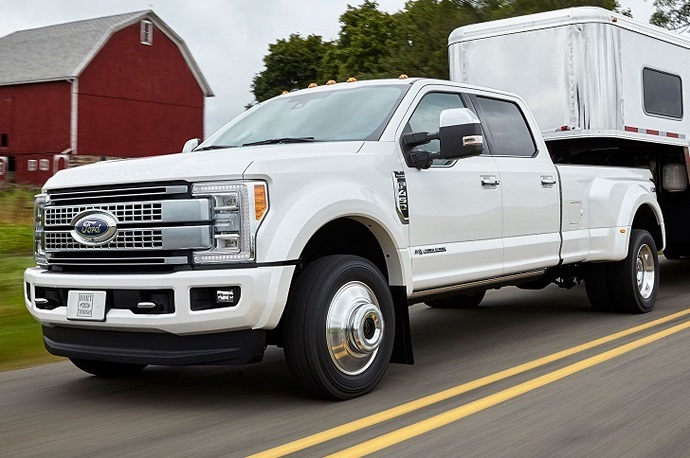 If you among those who need a serious workhorse truck which is capable for impressive towing and payload capacities but also delivers good ride quality when unladen and includes well-equipped and comfortable cabin than Ford’s F-450 is truck for you. This full-size one and a half ton truck version was redesigned for 2008 model year and equipped with a 6.4 liter V-8 turbodisel engine that produced 350 hp and 650 lb-ft of torque. The next 2009 model year brought special edition Harley-Davidson package while more substantial changes came for 2011 year when model introduced refreshed styling, 400 hp tubodiesel engine, a six-speed auto gearbox and so. Next notable updates were promoted for 2013 model year and they included improved brakes, new Platinum trim and new MyFord Touch infotainment system. Now two years after the F-150 redesign, the Blue oval brand apples the similar strategy for Super Duty series including F-450 model. The new 2017 Ford F-450 Super Duty brings aluminum body, fortified frame, powertrain enhancements, improved interiors and new modern equipment features. Its styling has also been refreshed. This model will be available in Crew Cab style only and five trims including XL, XLT, Lariat, King Ranch and Platinum. When it comes to power, the 2017 Ford F-450 Super Duty will be equipped with a 6.7 liter V-8 turbodisel engine which will be standard across all trims. Also standard on this model will be a 6-speed TorqShift auto transmission and part-time four-wheel drive system including also auto-locking hubs, low range gearing and electronic locking rear differential. Unfortunately, Ford hasn’t revealed full specification of this powertrain despite it said that some improvements will be included. The current models with the same dispalcment produce 440 hp and torque hits 860 lb-ft. This allows a peak towing capacity of 19, 000 pounds with a standard trailer or in case of the trailer with fifth-wheel or gooseneck rig it can tow up to 31, 200 pounds. However, Ford hinted improvements on all these fronts and all numbers should go up. It is also announced that driveline components including suspension, axles, brakes and so on will also be fortified in order to support better and safer towing and as well as driving quality. As for fuel economy EPA doesn’t estimate this size trucks but models will be using an exhaust braking system. When we are talking about new 2017 Ford F-450 Super Duty, the most significant aspect of its redesign is related to its frame and body construction. There, Ford has implemented modern lightweight materials in much more extent. The frame of this model has been constructed of high-strength-steel which takes more of 95 percentages of its structure and with this, Ford claims it is stiffer 24 times compared to the last version. Ford has also used lightweight aluminum to construct most of the body panels which together with weight reduction of the frame will lead to total weight savings around 300 pounds. Aside from that, styling of this model will not present big modifications except its skin is now made from aluminum. The boxy design remains with swollen fenders and front fascia has been refreshed. On the front, quad beam headlights are situated on each side of two-bar grille. The grille version with perforated slats is also available. Being available in Crew cab version only, interior of this model will offer plenty of space for up to six passengers with enough leg and head room. Of course interior appointment will depend on chosen trim level where everything from bare-bones XL version to higher luxury-furnished trims will be available. Models can also be had with upgraded Sync 3 infotainment system which supports Apple car Play and Android Auto. What is also important model will offer new upgraded camera system which covers up to seven cameras and safety package will be expanded for new systems. As it was mentioned a few times, new F-450 will come only as four door Crew Cab, four-wheel drive model with standard dual-rear wheels. Two bed lengths 6.6 and 8 foot will be available. You will also be able to choose five trim options ranging from basic XL and XLT version to more luxurious Lariat, then King Ranch and top-of-line Platinum. Across these trims, Ford F-450 will be available with vinyl, cloth or in higher grades with leather upholstery. All models will come with tilt-telescoping steering wheels. More expensive versions will add auto-dimming rearview mirror, power adjustable pedals, dual-zone climate control, remote start engine, rearview camera, etc. Heated and ventilated front seats with driver memory setting will be available on the King Ranch and Platinum trims as well as heated steering wheel. The Sync 3 infotainment will start from XLT while navigation and GPS will be standard on top two trims. Base XL models will include six speakers sound system, seven speakers are available on XLT versions while the rest of line will include 10-speaker premium sound system. Different equipment packages will also be available as well as power moon roof, heavy-duty alternator, a spray in bed liner, cargo LED lighting, cargo box camera and so on. For the safety, standard equipment covers anti-lock brakes, traction control, brake assist, a post collision safety system. Most trims will have Sync3 emergency telematics. Upcoming model will also bring the surround view system, and more cameras like trailer mounted camera, cargo bed camera and more. It will also add adaptive cruise control and forward collision mitigation in some versions. No doubt that Ford has done great job on the new Super Series trucks including one and a half ton 2017 Ford F-450 Super Duty. Probably the things will sound even better when full specification including power, torque and towing ratings would be revealed. These details should be known closer to the release date which will happen late this year. This model will go on size equivalents from Ram and Chevrolet. The price will start from about $53, 950 for base XL versions and will go up to around $77, 120 for top-of the line Platinum trimmed models.